Ok, so I know I am way late getting on the bandwagon with this one but I am in love with Polyvore. I know it's been around for a while and I did check it out briefly when it first started popping up in the blogosphere but I guess I didn't see the benefit of using it until now! All of our friends decided that this would be the year to get married and as of right now we are attending 4 weddings over the next several months, the first one being this weekend. Each couple is very unique and their weddings are all across the board in terms of style, theme, and location. This weekend's wedding is in West Palm Beach. Even though it is March, it's still cold outside and the wedding is in a hotel and will be more formal than some of the other weddings we are attending this year so the first thing that came to mind was a little black dress. 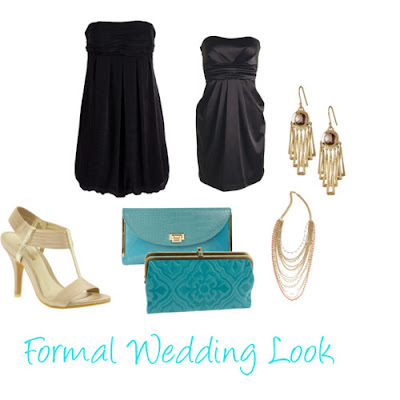 These are some looks I put together for a formal wedding. I seriously love the gold shoes. I couldn't decide between the two black dresses...I love them both, what do you think? I also like throwing in a bit of color so the look doesn't become completely predictable or boring so I picked out a turquoise clutch...two actually, I couldn't decide between those either. Opinions? i've never used polyvore, I'll have to check it out! I feel ya on the weddings. I had 4 last year- so 4 weddings, 4 bachelorettes, 4 bridal showers, 2 engagement parties... it can be exhausting. glad you had fun! Wow, that is a lot! I definitely feel your pain...I'm sure next it's going to be baby showers!